Dinosaur Comics - June 10th, 2011 - awesome fun times! 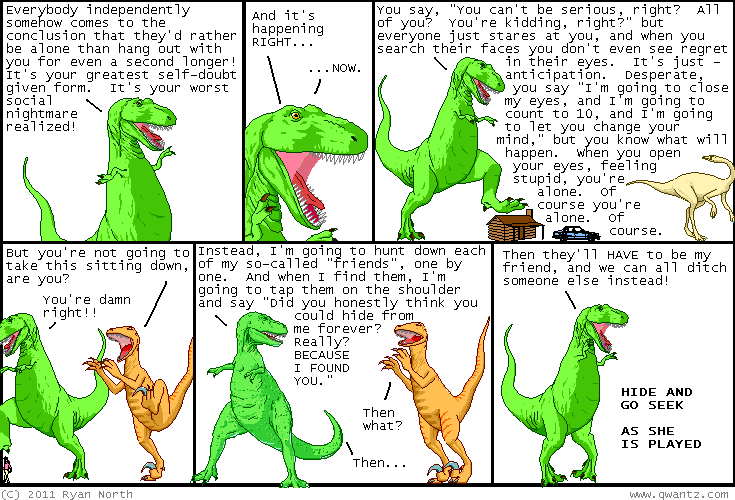 June 10th, 2011: Haha, okay, so wanting to hang out with my awesome readers I thought I'd start a BRAND NEW FANCY FORUM for Dinosaur Comics! And to make it super awesome it's part of Andrew Hussie's MS Paint Adventures forums, turning the "MSPA" in "MSPA Forums" into the "Multiple Site Pal Association". YES. Anyway it turns out this was a GREAT IDEA because not only do we get a seed of awesome people to talk to, BUT, there's already a fan music thread complete with a rap song about Dinosaur Comics AND A MUSICAL VERSION of yesterday's comic AND "In The Hall Of The Mountain King" synthesized using the screams of children (from this comic). We have Radiation and Jit and _L_ to thank for these, in respective order! All this in a single day. AMAZING. Anyway let's all join and hang out on the internet!